Easter Egg Hunt After all the egg decorating, it is fun to search for Easter eggs, outdoors if possible. 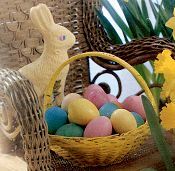 Incorporate a new tradition of adding a special Alleluia Egg or golden egg (see Holy Saturday Activities). The person who finds this egg wins a special prize, or gets to perform a special coveted task. Easter Baskets Easter baskets are an American tradition, full of chocolate bunnies and eggs, jelly beans and marshmallow candies. Originally the Easter baskets were a way to celebrate the end of Lenten penance. All foods that were forbidden during Lent are placed in the basket and blessed: cheese, butter, eggs, meats and sweets. For those that are sugar conscious, the baskets can also include little toys, books, flowers, religious holycards with pictures of the resurrection, and a few Easter eggs. There should be reminders that this is the feast of the resurrection, and not just a day to "pig out." Blessing of the Family Table "The Easter liturgy is permeated by a sense of newness: nature has been renewed, since Easter coincides with Spring in the Northern hemisphere; fire and water have been renewed; Christian hearts have been renewed through the Sacrament of Penance, and, where possible, through administration of the Sacraments of Christian initiation; the Eucharist is renewed, so to speak: these are signs and sign-realities of the new life begun by Christ in the resurrection. Popular piety intuits a constancy in the relationship between Christ and his mother: in suffering and death and in the joy of the resurrection. The liturgical affirmation that God replenished the Blessed Virgin Mary with joy in the resurrection of her Son, has been translated and represented, so to speak, in the pious exercise of the meeting of the Risen Christ with His Mother: on Easter morning two processions, one bearing the image of Our Lady of Dolors, the other that of the Risen Christ, meet each other so as to show that Our Lady was the first, and full participant in the mystery of the Lord's resurrection.